Join instructors Lauren and Dean for two days of practical ice training, certified by Rescue Canada. After an introduction to the hazards posed by a frozen lake or river and how to mitigate them, you'll get kitted out in a drysuit, PFD, and all sorts of specialised gear. We'll have you practicing a variety of self rescue techniques, buddy-rescue techniques, ice travel techniques, and get you thinking about how you can incorporate safer work practices into your job. 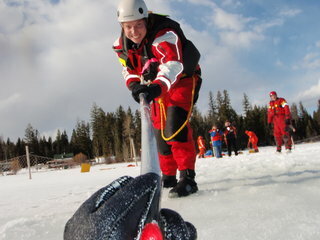 For more details check out the Ice Safety/Rescue Technichian II page. Registration is $375 plus GST per participant. If you have recently (within 3 years) completed a Rescue Canda ice course of the same level or higher, recertification registration costs $260 plus GST. Phone OVERhang for more details. Rental of drysuits, PFD, and full personal kits is $175 plus GST. This is a private course hosted in Tatla Lake in the Cariboo Region - if you wanto find out if we can add you as an exception, contact Lauren at OVERhang to inquire directly.